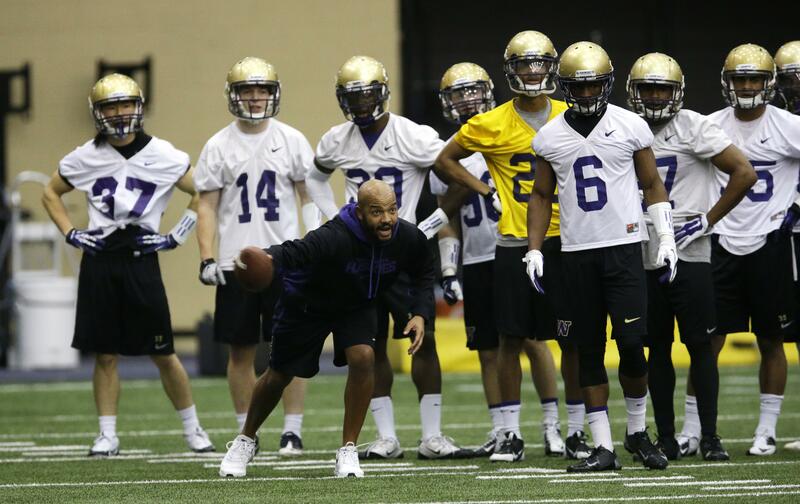 SEATTLE – Jimmy Lake, Washington’s popular co-defensive coordinator and defensive backs coach, is expected to remain with the program in 2018, multiple sources have confirmed. Lake, a North Central graduate who played at Eastern Washington, has been linked to other coaching jobs this year, and he nearly left the Huskies last offseason to be the defensive coordinator at California. He remained with the Huskies after Cal declined to pay the $500,000 buyout in his UW contract, a source told The Seattle Times. KJR’s Dave “Softy” Mahler was the first to report of Lake’s intention to return to UW for a fifth consecutive season in 2018. Lake earned a promotion as co-defensive coordinator in December 2015 and a raise then to $500,000. He was awarded another salary increase, to $650,000, for 2017. Under Lake, the Huskies’ secondary has ranked among the best in the Pac-12 the past four seasons. He has also built a reputation as one of the Huskies’ best recruiters, helping sign Budda Baker, Sidney Jones, Taylor Rapp, Jordan Miller, Jojo McIntosh, Byron Murphy and others. He is UW’s primary recruiter in Los Angeles. For the past several weeks, UW coach Chris Petersen has been working on increasing the salary pool for his assistant coaches for the third consecutive year, sources told The Times. All nine assistants were given raises following the Huskies’ 2016 breakthrough. The salary pool for those assistant coaches was $4.675 million this year, up from $3.54 million in 2016. Defensive coordinator Pete Kwiatkowski, awarded a raise to $875,000 for 2017, is expected to get another pay bump this offseason that could put his salary closer in line with the highest-paid coordinator in the Pac-12 (Oregon’s Jim Leavitt, at $1.15 million annually). The Huskies have ranked atop the Pac-12 in scoring defense and total defense in each of the past three seasons. Published: Dec. 14, 2017, 6:07 p.m.